This is a rare weekend post and it’s MASSIVE. Lots of swatching has been going on in the Mani Cave! I’m excited to show you all twenty-one (YES, 21!!) new releases from I Love Nail Polish (ILNP). ILNP is one of my favorite indies and Barbra, the brains (and muscle) behind the operation has been busy! I love me some glittery goodness, but I’ll always favor my beloved crèmes…and holos are a close second. So ILNP’s new collection of crèmes and holos had me at…um…crèmes and holos! Bonus: 3 duochromes too! There’s lots to see so I’ll keep the commentary to a minimum. There are six crèmes in a nice range of pastel to punchy shades. I’ve been wary of indie crèmes – it just seems like it would be impossible to get a consistent, buttery formula in a hand bottled operation. But all six ILNP crèmes had an excellent formula. All swatches are finished with Seche Vite. Next we have the standard holos. The subtle holo finish is similar to the first batch of ILNP holos. These are a great way to get your holo fix without stopping traffic! Application was easy peasy. I love that navy blue! And the lighter colors are a great option for work. Next we have the ultra holos. And by ultra…she means ultra. Most of these are seriously Color Club holo-y, which is major. My camera really had trouble focusing, but I think you get the gist. Keep in mind, these were taken indoors, so imagine what these are like in the sun! All swatches are two coats. Topcoat didn’t effect the finish at all. I used Seche Vite. And last, but not least, we have three cool duochromes. These look like standard metallics in my photos…but trust me…there is some intense color change going on here. I’ll do my best to describe it. All swatches are two coats. The formula was nice and I didn’t have any issues with brushstrokes like I anticipated. Green Goblin is a rich green that turns olive and gold. Neutron Starlett is a deep teal with shades of purple and green. Northern Lights is a steely dark blue and purple. Shew. That’s the biggest single polish post I’ve ever done! Can you imagine if I’d posted this in the “olden” days of modems? You’d have to click on this page and then go take a bath while it loaded. How did we even tolerate that? Thank you so much to Barbra for giving me the awesome opportunity to try out these awesome polishes first! She’s not only a talented indie maker, but a great friend and joy to work with! You can buy ILNP from the online store for $10 (12ml). Get social too! 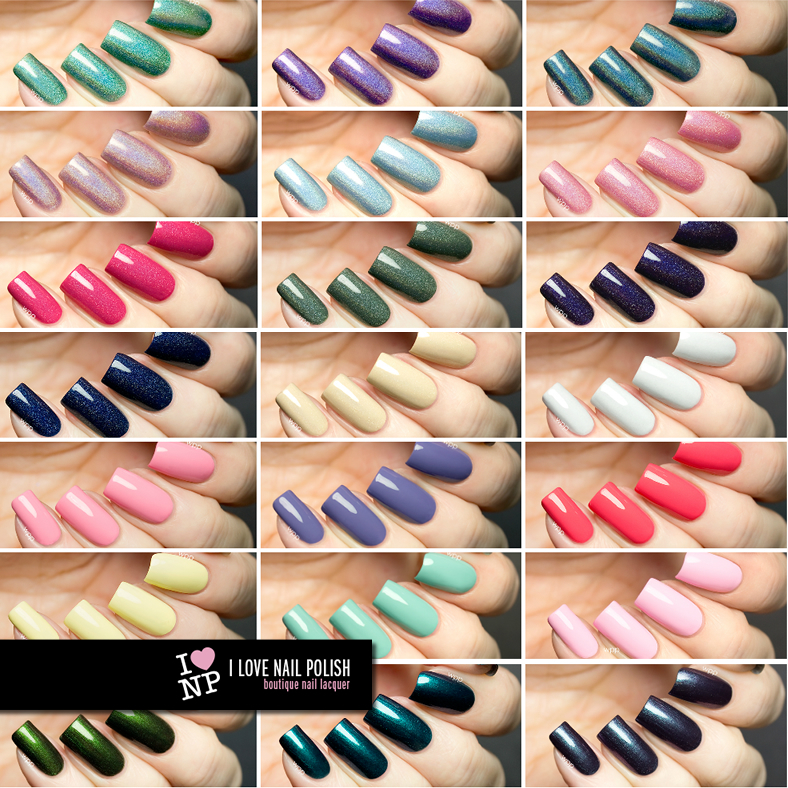 The ILNP facebook community is a MUST-follow for every polish addict. Interact with nearly 175,000 other lacquer fanatics and see awesome manis from around the web. You can also find ILNP on Instagram.